This article is a primer for those of you new to eLearning and learning technologies. Maybe it is just me, but some of the terminology thrown around in articles, books, and blogs force me to hunt down definitions in Wikipedia. And we all know that Wikipedia can’t be wrong. Part 1 of this two-part article explained what’s involved with planning, development, and delivery of training using modern technology. In preparation of part 2, I asked readers to take in a short online survey. Part 2 summarizes the basic components of eLearning material creation and publication for online use. Producing the material using slide presentation tools. Delivery of the course content in the classroom. How eLearning compares with live classroom. Before jumping into the tools and mechanics of online learning, let’s summarize the results of our online survey comparing traditional classroom to online (eLearning) approaches. This survey is composed of just four questions designed to take a snapshot of the state of the learning industry. The survey had 161 participants and was active from late October of 2015 to early January of 2016. This is the fourth survey that Leading Software Maniacs has performed since 2011 . Question 1: How Do We Like To Learn? There are many ways that we enjoy learning stuff at work. Some of us like only one way to learn and others like a variety. Prioritize the learning methods you prefer. 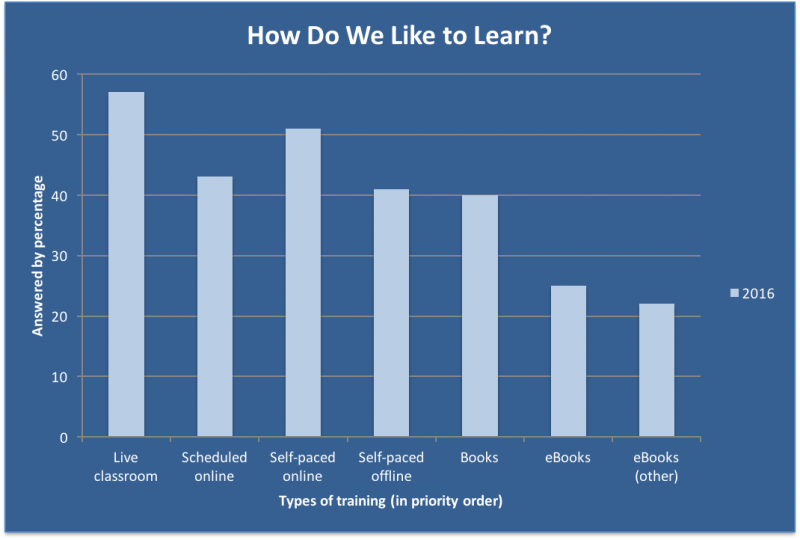 Respondents selected their preferred method of receiving training in order of priority. Overall, live classroom is still the most preferred followed by self-paced online. Question 2: Cost Of Training. Some folks believe that online training shouldn’t cost as much as live training. eLearning content shouldn’t be less expensive. Using online classes actually save the attendee money for travel and hotel. Class fees should be lower due to no instructor travel, venue, and other expenses associated with putting on a live workshop. Some folks (especially Instructional Designers) assert that online. Same About the same fee, I'm learning the same stuff regardless how the class is presented. Less Online fees should be lower (my boss won't approve it if online classes aren't lower in cost). More Online fees can be more expensive, I live in a rural town and I don't have to take time off from work to attend. No opinion I don't have an opinion at all. 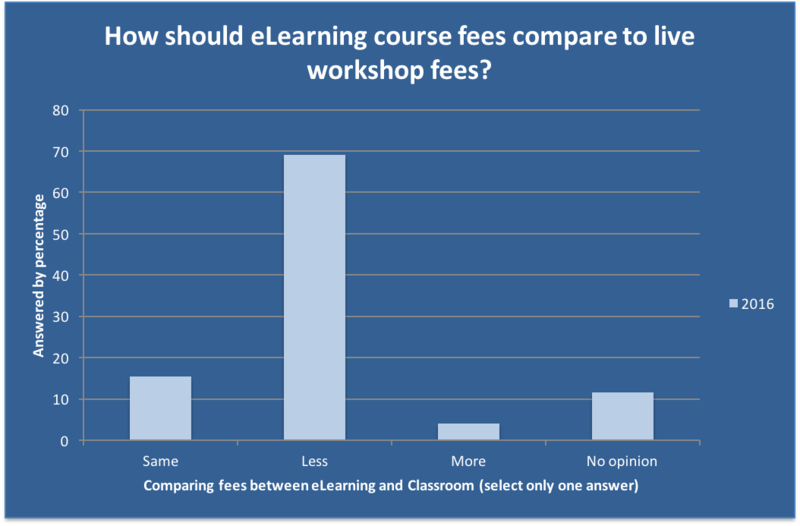 The overwhelming feedback from respondents is that eLearning courses should have lower fees than those of traditional classroom courses. Question 3: Optimum Amount Of Time For Classes. It seemed like workshops used to take several days and the trend is for training events to take place in much less time. (Best answer you can!) On average, how much time should a workshop take? Multiple days Three to four days (24-30 hours) of instruction is fine (I don't like rushed workshops). One day One-day (6-8 hours) is about perfect (shoot, I'm out of the office anyway). Half day I can't stand sitting too long: A half-day (3-4 hours) is all I can bear. Two half days I prefer about 8 hours of instruction divided up into two half-day sessions. No preference I prefer about 8 hours of instruction divided up into two half-day sessions. Although respondents favor multiple day training the least, it is a tossup between an 8-hour training workshop (one day or spread out over two half-days) and no preference at all. Question 4: Let’s Make Learning Fun! With advances in learning and eLearning technology leading to improved motivation and job satisfaction, is it no wonder that the industry is adopting games? According to the latest survey, 40 percent of the Global 100 are using gamification as a primary form of retention of information from learning activities. Love it We are already using game technology with wonderful results. Not great We already use game technology and I consider it marginally effective. Want to use I wish we could jazz up our training with games (we could use some improved motivation and collaboration around here). Coming soon Funny you ask — we're going to use it pretty soon (can't wait to see the results!). No opinion No opinion, I'm not sure games could make a difference. 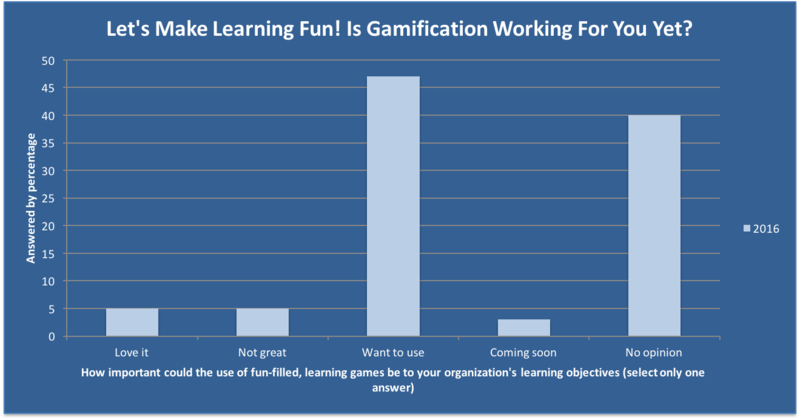 The leading response among respondents is that they want to try gamification as part of their learning program followed closely by those who have no opinion. It is often best to present concepts from the customer’s user experience first then summarize the systems used to create and deploy the learning material second. The user in this case is somebody participating in some sort of learning activity in either a class or workshop. This understanding of the needs of the customer is paramount. Using survey results can be an excellent way to understand the needs of the user before determining how to present learning material for best impact. 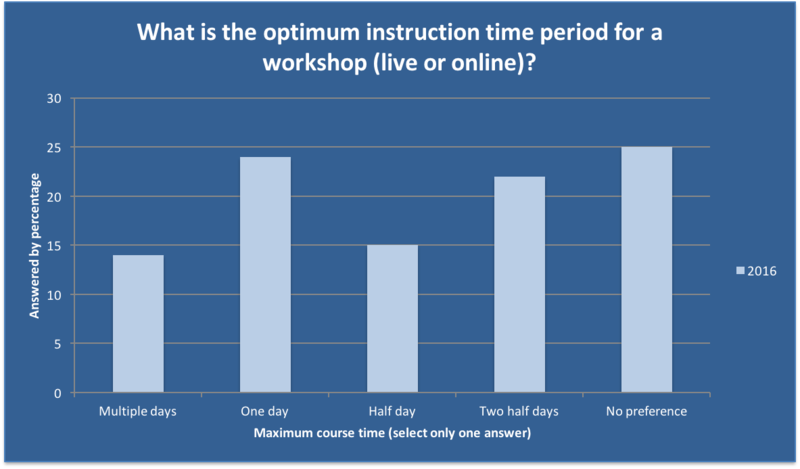 If, for example, surveyed students prefer half-day courses you may miss the mark by offering multiday workshops. If participants hate games and yet you offer a learning course presented in the form of games, be prepared for major pushback. As more and more of the learning industry is moving to an online (eLearning) classroom, you are going to have to create or adopt a way to deploy information and manage students oftentimes taking learning at their own pace and on their own schedule. Isn’t that the whole idea with eLearning? 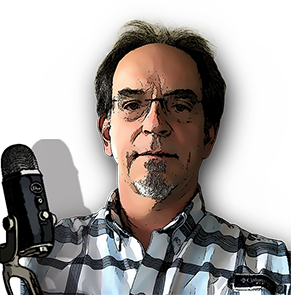 As the technology staff member is becoming more virtual (working out of their homes or geographically distributed into small offices throughout the world), the need for an effective learning system becomes even more critical. Package learning material in a variety of forms that work with your students (streaming video, downloadable, workbooks, and so on). Provide a mechanism to validate students to access learning material. Incorporate administration features that allow staff to review student progress towards using the eLearning tool. Include the tools to create the learning material (video editors, handbook creation tools, quiz makers, and so on). Enable quiz and gamification (game concepts used for non-game material) tools that can control how students move forward with their learning. Automates grading and certificates of completions for students. Monetization where students are authorized to pay for each class (www.PDUs2Go.com) or subscribe to take as many courses they can (www.Lynda.com). Alternatively, students may be pre-authorized and organized into virtual classrooms. Incorporate collaboration tools enabling users to share information, ask questions, and interact with other students taking the same class. This is a great way to ask questions to your teacher, too. Provide access with any device (PCs, Macs, tablets, and smartphones). You may be tempted to develop an eLearning system all by yourself – that would be a waste of time. Whether the Learning Management System provides K12 or corporate eLearning solutions, there is no lack of commercial solutions available (well over 500) . One major benefit in adopting an eLearning program is that education can scale to students without regard to location, time zone, and possibly even language. Online education can scale from a typical physical classroom (limited to perhaps 30 students) to thousands of students who can access eLearning courses just by having a computing device and an Internet connection . The challenge becomes handling an almost unlimited number of online students. The ability for an Learning Management System to use sophisticated software to quiz, grade, verify, and interact with students usually separates one Learning Management System solution from others. The more intuitive the interaction between training and students, the more the student benefited from the impersonal training you’d expect from computing devices. You will also be able to personalize the training by letting the Learning Management System software track a student’s progress and, as a result, employ additional computer-based tutoring or suggest the next best course to take. Many of the better Learning Management System solutions provide open access to their APIs so that you can extend the course deployment capabilities with add-ons like gamification or custom learning modules (Instructure and DigitalChalk come to mind). To wrap up this article, we can’t forget about the importance of introducing fun into the learning process. Engagement with the learning material for the purpose of retention is a very important concept in learning. Just because you are in a live physical classroom scribbling notes from concepts communicated five minutes ago doesn’t mean that you are truly absorbing the material. And that’s where gamification comes into play. Gamification takes game technology to a new level by using competition and individual achievement to reinforce what you just learned through classroom or eLearning. 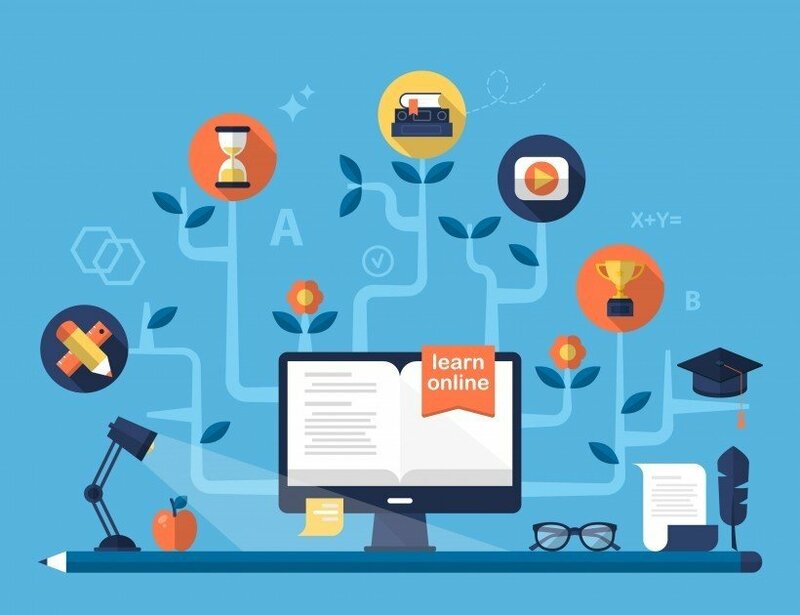 Some Learning Management System solutions integrate gamification concepts into their courseware workflow while many treat gamification as an add-on to the learning process. Currently, there are many gamification products that are custom and can be quite expensive to implement. Whitaker, Ken. “Fundamentals of Learning Technologies Part 1.” Leading Software Maniacs. October 26, 2015. Whitaker, Ken. “eLearning vs Classroom Annual Survey Results.” Leading Software Maniacs. November 5, 2013. Capterra. “Top LMS Software.” Capterra: The Smart Way to Find Business Software. Koller, Daphne. “What we're learning from online education.” TED.